3M™ Gold Abrasives are the standard that shops have turned to for quality, performance and durability for over 25 years. Our Gold Abrasives are precision coated with high quality minerals and resins to deliver longer-lasting discs that cut through a variety of surfaces - including paint, primer, fiberglass, metal and SMC. 3M™ Gold Abrasives produce uniform, consistent finishes and are available in both Stikit™ and Hookit™ options for convenience and reuse. When job quality and productivity matter most, turn to the abrasives that shops have relied on year after year. For Featheredging and Primer Sanding (Grades 80 - 800) These products are designed to provide productivity in a variey of applications from express repair to larger body repair. Use the coarser products for sanding and featheredging filler and putties, and the finer grades for further refinement and primer sanding. Seven holes for dust free sanding. Use for fine featheredging or the last sanding step before priming. 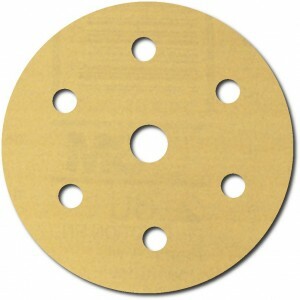 Recomended disc pad 05865 with soft interface pad 05777.